If you’ve been putting off Spring Cleaning since, well, last Spring because you just couldn’t bear the inevitable sulks and moans from your children and you were just too tired to do it all yourself, help has arrived! Use these fun and helpful tips to make Spring Cleaning stress-free, productive and…dare we say it? FUN! Here's 5 helpful tips to make spring cleaning fun for the whole family! Rewards System. You probably think that your kids should want to live in organized, clean spaces and that’s reward enough, but getting to that point is going to take some incentives. Come up with a reward system ahead of time to keep your kids motivated and on task. It can be a family outing to the movies, or a movie night at home, a trip to the park, the promise that your kids can have their friends over in their newly cleaned rooms, or even a long coveted gift. When in doubt, resort to cold hard cash: $1-5 for each trash bag filled with outgrown items to be donated, or trash. Zone Defense. You’re pretty sure your daughter has three other people living in her room judging by the sheer amount of stuff she has piled everywhere. Instead of closing her door and hoping for a small fire, divide the room into Zones that take about an hour each to de-clutter and organize. Yes, this may mean you have 45 zones in her room, but with small, manageable areas to organize, she’ll get a sense of accomplishment and you won’t have to do it all yourself. Allow her to establish her own deadline for when she will have the bulk of the Zones completed. Eliminate Distractions. This is going to sound harsh, and you’re going to have a great deal of push back, but if you don’t want to wander back into your child’s room and find her sitting on her bed texting her friends, you’re going to have to turn the Internet off. One strategy is to turn it off for 50 minutes out of every hour, and then allow a ten-minute break/online fix. Half of the fun of Spring Cleaning is getting to complain about it on SnapChat. If you’d like a handy way to organize tasks and deadlines, remember that SignUp.com has you covered. Create a SignUp listing all of the tasks you’d like to see accomplished, and allow your family to sign up for them. Free automated reminders and the satisfaction of seeing the progress visually documented will keep everyone motivated and on-task. 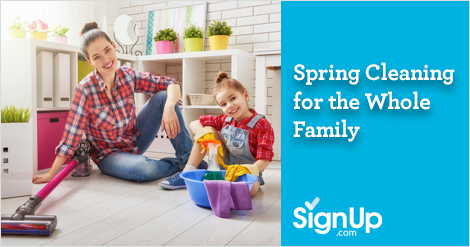 Spring Cleaning just got a whole lot easier for the whole family!